So, I promised I’d tell you where I’ve been, and here it is: I’ve been on vacation. No, not the kind of vacation where you hop on a plane, travel to some far off beach destination, sleep in foreign sheets, and sip cocktails all day under the sun. This wasn’t even the kind of vacation where you take any real time off of work. Nonetheless, this was my summer vacation. You heard me right. Canning. 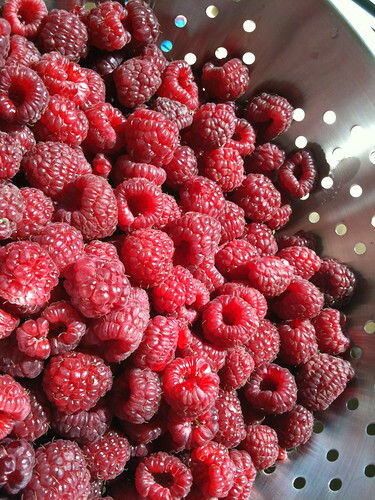 Smashing berries, boiling up batches of simple syrup, stuffing food into jars. Admiring the end of summer bounty neatly preserved in glass. Canning. There’s been a movement going on. They’re calling it a Canvolution. I’d say it fits quite nicely with the effort many are making to buy their fruits and veggies when they’re in season and at their peak. We’ve gotten very used to having nearly all forms of produce imaginable at our disposal year-round, but the fact is that everything has its time in every place. 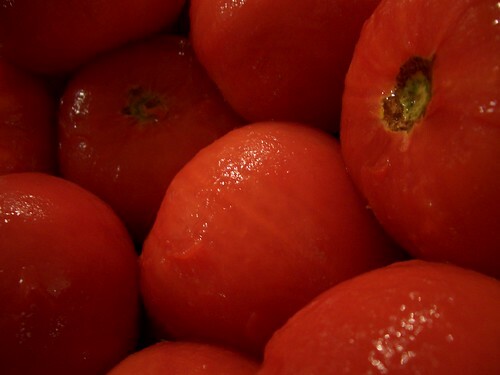 Tomatoes do not grow in December where I live, nor do peaches, or cherries. 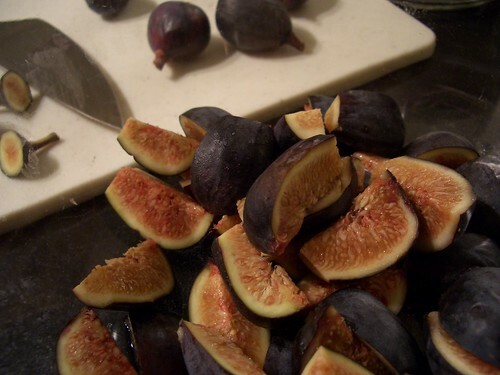 The ones that you see in the supermarket out of season generally come from hundreds of miles away, picked before they’re ripe. Some are even treated to a dose of gas to force their ripening before they arrive, looking perfectly edible, in a supermarket near you. Canning allows you to gather up your favorite seasonal produce, at the very moment that it’s at its best, and suspend it in time, preserving it for you to enjoy months later. And I have to say, I have been enjoying it immensely. So much so, in fact, that the initial 3 dozen jars that I purchased were not nearly enough to contain all the projects that I simply had to undertake. When I began, I thought I’d probably only do tomato sauce and maybe some pumpkin puree in the fall (the latter of which I was disappointed to discover is seriously discouraged by the USDA). 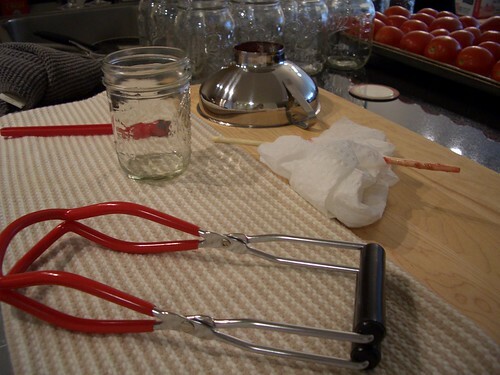 But, after picking up my very first book on canning (I’d highly recommend that this be yours as well) and reading through the hundreds of recipes, I just knew that I had to make pickles. And jam! 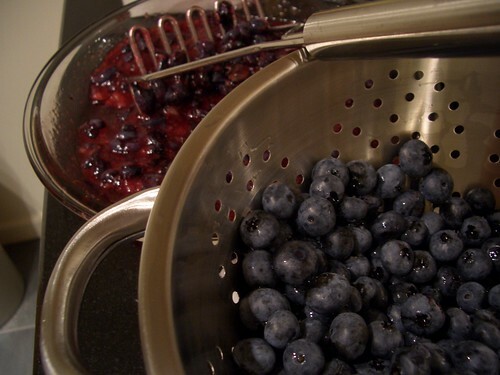 Oh, I’ve quite fallen for blueberries this past summer and those recipes for blueberry jam screamed to be made. And how delicious honey spiced peaches, eaten right around Christmastime, seemed in my head. I got out my flags and began marking pages. Then my canning kit arrived (if you purchase this one, be certain to also pick up a lid lifter ), and the next two weeks I took Friday off of work. This was my “time off” this summer. I spent those mornings out of the office deciding which produce to seek out that day and tallying up how much I’d need to create the recipes that I’d selected. I then headed to the farmers’ market, filled my arms with as much as I could carry, hopped in a cab (I learned my lesson by way of heirloom-tomato-smushed-in-a-crowded-subway a couple weeks earlier), and rode home beaming at the sheer quantity beside me. 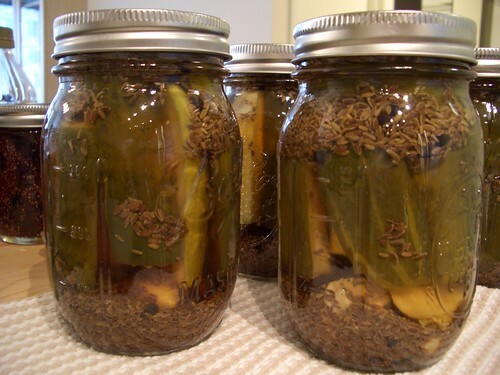 That first weekend was pickles: garlic dill cucumber and green bean pickles. The recipe for these pickles was discovered in a little gem of a book released this year called Jam It, Pickle It, Cure It . I have to say, and maybe it’s just because they’re mine, these are the prettiest pickles I’ve ever seen. Also that first weekend: blueberry jam and fig preserves. It’s hard to describe the immense satisfaction that comes with hearing your very first jar seal, and it’s amazing how every one after that continues to feel just as good. The sound is most commonly called a “ping,” but this is misleading. Rather than a high, thin, musical declaration of your success, the actual sound is a low, dull, and definitive “phwhop.” It’s an inward-sucking pop that breaks the silence like a firm slap on the back for a job well done. After those first few jars, and after literally a few dozen more, I was in disbelief. The whole process, the whole idea behind the thing seemed so impossibly simple. How could I not have been doing this my entire life? My enthusiasm led Chris and me upstate one weekend to Samascott Orchards, where we picked up 30 pounds of tomatoes and 25 pounds of peaches. If you’re planning on doing any canning this or next year, I’d highly recommend finding a nearby farm and buying your produce in large quantities directly from the farmer. Both peaches and tomatoes had previously been costing me $2 per pound at the greenmarket. I purchased all 55 pounds of produce that day for only $30. Needless to say, I’ve been busy. Presently, my hoard includes: garlic dill cucumber and green bean pickles, blueberry jam, blueberry pie filling, blueberries in syrup, fig preserves, blackberry jam, raspberry jam, spirited peaches (with rum), peaches in syrup, honey spiced peaches, peach butter, crushed tomatoes, and a couple quarts of unexpected tomato juice. I perhaps have a bit of a problem, and especially so considering that I’m not quite finished yet. Apple butter, anyone? I’ve been asked several times now, What are you going to do with it all? Well, I plan to eat it. I’m sure a few jars will become gifts (some already have), but the whole point of putting up food is to enjoy it during those months when it isn’t (or shouldn’t be) otherwise available. 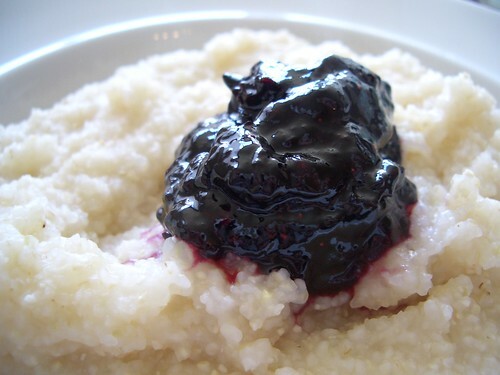 I’m looking forward to spooning blueberry jam over hot brown rice farina, the morning sun gleaming off streets gone white with snow. 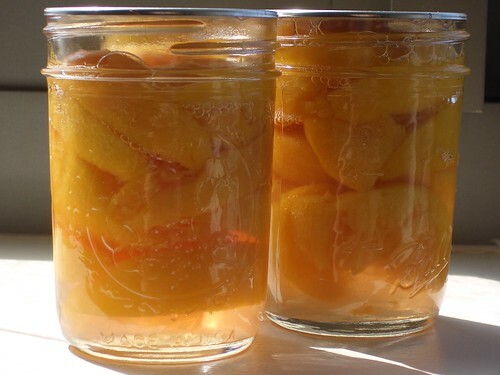 I’m excited for the sweet, liquored treat that those rum soaked peaches will become some chilly night. 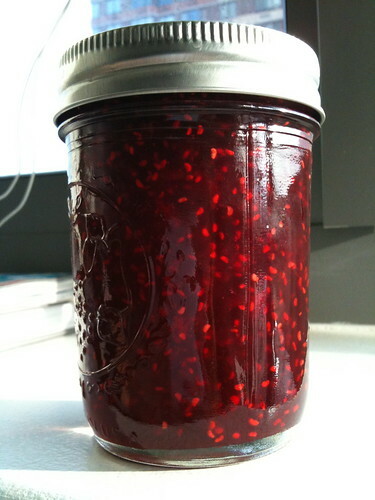 I cannot wait to break the seal on that blackberry jam and smell the perfume again, that deep ambrosial scent that left me heady and soft in the heart, fingers stained a winey purple. I’m going to taste summer, remembering the days spent strolling through the crowded Union Square market, recalling each and every berry, the satisfaction of beautifully sealed jars. That’s what I’m going to do with it all. 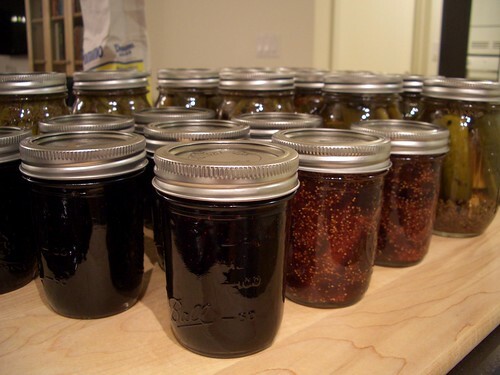 It’s easy to think of canning as a relic of sorts, something our grandmothers and great-grandmothers did. It’s not something we need to do anymore. It is, however, fulfilling, it allows you to know your food, and to enjoy all of your favorite produce at its peak the whole year through. It’s not complicated—it’s simply a process. With a bit of patience and focus, anyone can can. And maybe, instead of being an art lost generations ago, it can be a ritual that we’ll revive and pass on to our children, something that they’ll recall as a mark of summer’s close the same way that pumpkin pie is Thanksgiving’s true centerpiece. The Canvolution, like any revolution, is just the beginning. I’m already looking forward to next year–and this time I’ll be planning ahead. Maybe you will too. all of that sounds so wonderful!! i wish i had the drive to jump on the canning bandwagon, my grandma would be so proud, maybe next summer!